I have had the flu – the real, old-timey, why didn’t I get a flu shot, used to kill people style, capital-I Influenza. For the past 2 weeks, I was mostly confined to my bed, and there are whole days that are lost in a haze of drifting in and out of fever dreams. Christmas wasn’t exactly the holiday I had planned, because of that flu, but I am learning to shake off expectations, and just let it go. The kids were happy,and 30 years from now, they aren’t going to remember that we didn’t put up half the decorations, or make reindeer chow, but hopefully they will remember that there was a lot of laughing and I let them eat gingerbread cookies, for breakfast. It is tough, though – I have these glorious holiday ideas in my head; very specific visions of what makes the perfect Christmas. Ideas like, maybe I should start collecting Spode Christmas China, and then we can serve our Christmas dinner on this china, and it will become a lovely, cherished memory for the kids, this special holiday china, and 30 years from now, when my holiday table is expanded to include my childrens’ spouses and grandchildren, this china will be part of a set of treasured memories of every Christmas spent in my home. Clearly, marketing schemes work very well on me. It is awfully cute. But then I catch myself thinking, well, it is a great idea, but where am I going to store it the other 364 days of the year? It isn’t like this house has a Butler’s Pantry, or a China Storage Room. And how do you know where to stop, with Spode? 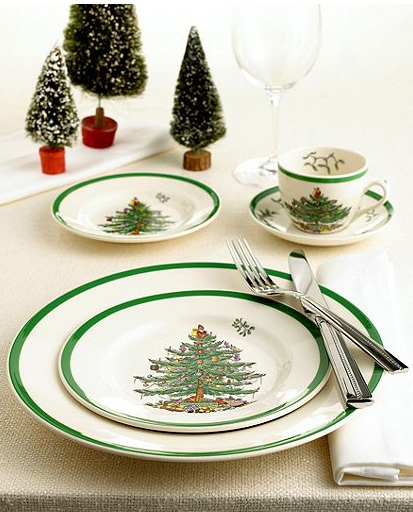 I mean, they make everything in this pattern that you could possibly make out of china – hanging balls for the tree, salt and pepper shakers, large china Xmas trees that plug in and have blinking lights on them, cheese spreaders with china handles, highball glasses and dinner menu holders. I worry that once I start down this road, I will feel compelled to buy it all, and Spode is smart: they do limited edition patterns every year, special annual plates, and that kind of marketing really speaks to me. I also fear that, if I buy any of it, my friends and family will recognize it as my ‘thing’, that thing that I collect, and every present I ever get to the end of time will be something in the Spode Christmas pattern. Clearly, it is a short path from a few pretty dinner plates to this monstrosity: the Spode Figural Deviled Egg Plate. 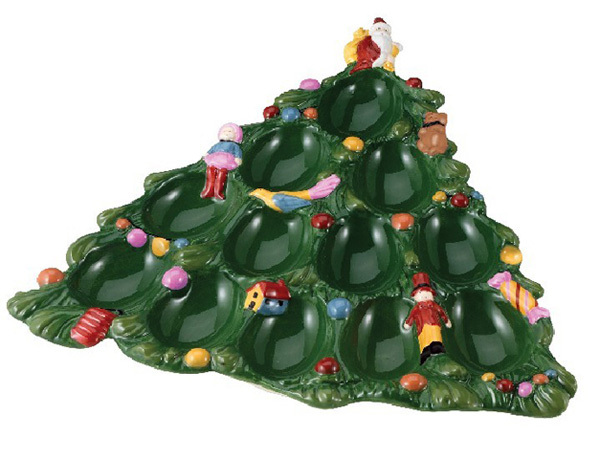 Internet, these are my first world problems.Should I buy Christmas China? This is what passes for a dilemma, in my fever haze. But I have this debate every year, when it goes on clearance after Christmas. Maybe this is the year. Maybe you are the horrible friend that is going to buy me that deviled egg plate. Hard to say.